The opening event, which runs 5pm-9pm, is free and open to all ages. Commissioner Eudaly will make a special proclamation at 6pm, followed by live drawing by local artists. Pizza will be provided by local sponsors Sizzle Pie. Beverages provided by Lion Heart Kombucha. 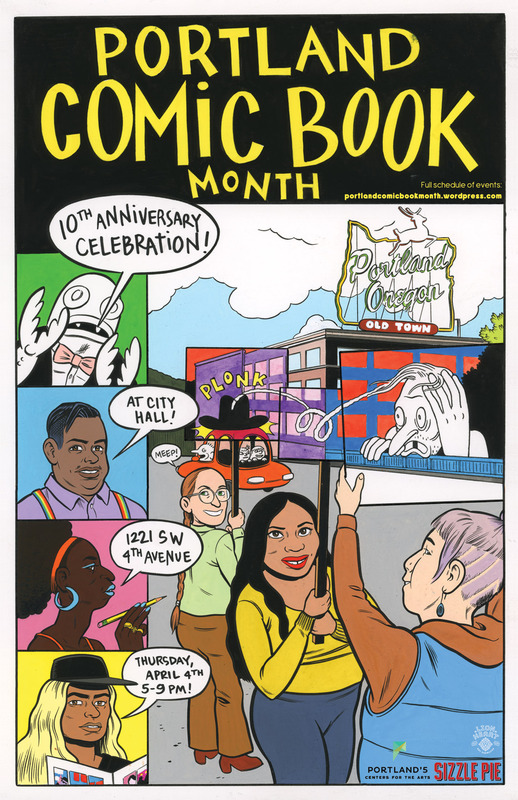 Look for more Portland Comic Book Month events throughout April, including workshops, readings, release parties, and meetups. See the full First Thursday lineup and April schedule of events at http://bit.ly/pdxcomicbookmonth. Thanks to our sponsors and volunteers that made this celebration possible: Commissioner Eudaly’s office, Anina Bennett, Pollyanne Birge, Books With Pictures, Floating World Comics, Ford Food and Drink, Sophie Franz, Helioscope Studios, IPRC, Lion Heart Kombucha, Sarah Mirk, The Nib, PNCA, Portland Zine Symposium, Portland’5 Centers For the Arts, PSU, Lisa Rosalie Eisenberg, Sizzle Pie, Reid Psaltis, Melanie Stevens, Liz Yerby and the Portland comics community.